Sofia for years has been a city of contrasts, of at first glance conflicting cultures. A city of the beautiful and the ugly, of the best from the European and the worst from the Oriental, a city of clean and dirty, of new and old. A city where alongside a Christian church you will see a mosque or a synagogue. A city of past and present, but with ever more unclear future. Where you can spend a wonderful afternoon in a cosy and amazing tea-room with home-made cake while you watch the tram station across the street where a mother of Roma origin is holding a crying girl by the hand. A city in which it recently became painfully clear that two warring societies live side by side - of those who want a change and stronger integration with Europe and of those who want the status-quo. In June, the big clash happened - precisely between these two oppositions. On June 14th, tens of thousands of Bulgarian citizens went out to protest the insolent proposal by the government a chief of the powerful State Agency for National Security (DANS) to become a highly controversial figure from the Bulgarian transition to .... democratic oligarchy - Delyan Peevski. The child of as controversial party from the transition - the Movement for Rights and Freedoms - presenting itself as protector of the interests of the Turkish ethnic minority in Bulgaria but, in fact, trading with influence and power - a genuine political corporation. After the initial shock from the really mass protest of the "cream" of the nation - the hardly recognisable in the everyday life middle class - the big campaign of division started. The protest was quickly caricatured as a protest of the "smart and beautiful", of the "rich" and "spoilt". The second phase of the attempts to crush it involved accusations of organisation funded with the money of global philanthropist George Soros with the only goal to ruin an actually good government. The opposition of communists and democrats has returned, of rusophiles and rusophobes (those who love Russia and those who don't). 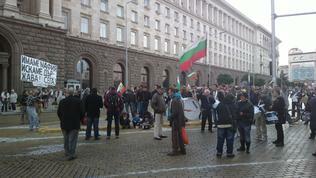 The tension rose significantly and hatred accommodated itself in Sofia. Hatred written on faces and walls. And inside the very protest there are also changes stemming from its continuity and the campaign against it. Among the most active protesters leading positions took PR specialists who direct every action to more performance in order to attract the attention of foreign media and to additionally underscore that the cream of the nation is among the protesters. 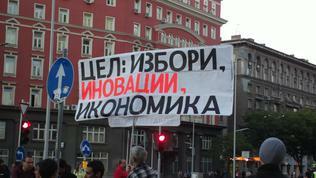 This repulsed that part of the protesters who wanted concrete actions that would lead to the main demand - resignation. But in fact, what is the main demand? This is a question that can very often be heard in Sofia reflecting the feeling of a deviation from the right path. What are the protesters fighting for - do they want only the resignation of this government or, indeed, the protest is systemic - against the very system which, for the past 23 years, had failed to transform itself into democratic and failed to detach itself from its controversial past. 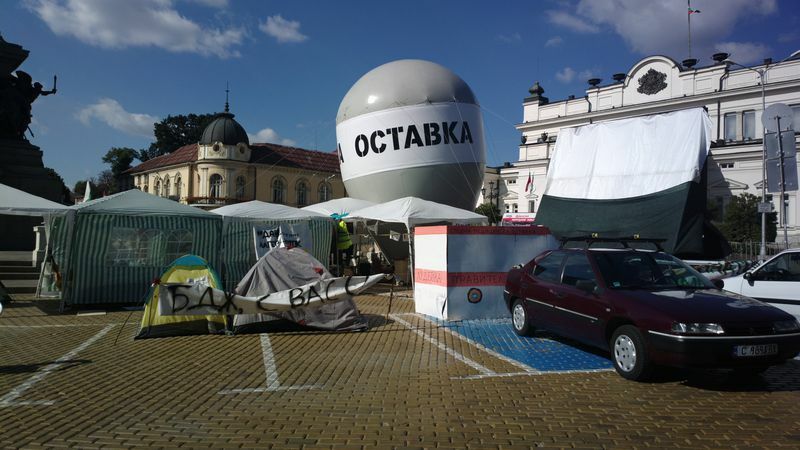 And as if to remind everyone why there are protests, in front of the parliament can be seen a huge balloon on which it is written with huge letters "Who appointed Peevski?" And in spite of this reminder, across the social networks and from conversations with various people in the city disappointment can be felt, uncertainty and lack of clarity - what comes next? How are we going to continue to live together? The tension between the most actively protesting people, the disappointed from the protest and its opponents is in the air. The accusations who, why and how accompany the very protest, too. No one believes anyone and everyone is suspected in pursuit of their own secret interests. One hundred days of solitude during which instead of the protests to grow in numbers and to unite around what needs to be done in the country, division seems more than ever an irreversible process. 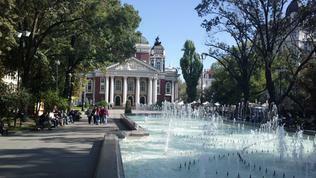 I went to Sofia a little after one hundreds days since the beginning of the revolt had passed - an absolute record. The square in front of the parliament and the government buildings and the presidency look in the day like a permanent stage - all the scenery is there and is waiting the people to come and bring life into them, while in the day no one pays attention. To such an extent have they turned into a part of the exterior. In front of the parliament there is a permanent tent camp. As later told me a colleague who guided me through the protest, those are several camps - the result of division and split. The balloon is owned by the Protest Network - an internal organisation of protesters which unifies various protesting groups on Facebook and the real world. The network was created with the aim to coordinate better the efforts to conduct more efficient actions. Alas, its work has been blocked by internal disputes and conflicts. This opinion shared with me Valentina Hristova, a 50-year old developer. She was standing somewhat lonely among the relatively small group of protesters a little after the starting time of the protest - 1830 - on the square locked between the buildings of the presidency and the government. Former communist buildings with heavy Stalinistical architectural breath. Recently, the square was renovated and created the feeling of freedom and scale. In the beginning of the protests, this square bearing the name "Independence" proved small to accommodate all those whose patience ended with the announcement in the National Assembly of the proposal Delyan Peevski to head DANS. 103 days later the square looks ghostly large. Nonetheless, the traffic is stopped at the fixed time, the noise from the whistles, drums and vuvuzelas overtakes the city noises. Valentina stands with a placard with which she is recommending all those who want a new nuclear power plant to go to Siberia. Although there is no one meters around her, she says she does not feel alone. 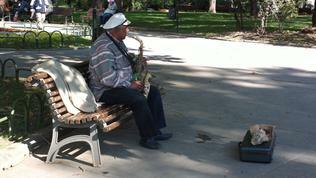 She understands those who are no longer on the square and admits that it was hard for her to change her daily habits. But the stake is too high. Moreover - it is no longer personal. The personal she had already achieved, she likes her job and wants her state back. She is still motivated and believes that she will not give up until the end. And when will the end be? When, then. According to her, the government cannot endlessly go against the most active people, those who can do something. 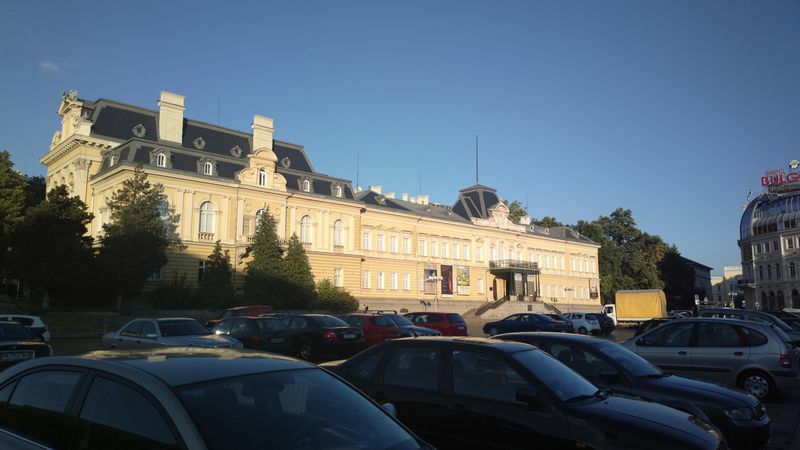 The resignation will be the beginning, then a solution to all the problems must be sought - the judiciary reform, the future of the land of Bulgaria, energy, where should the economy go. She believes that there are enough smart and publicly important people within the protest who can come up with a common document outlining the next steps. And although there are not many people on the square she believes the majority support the protest but are victims of the past. The biggest sin of the communist time is that it managed to persuade the people that nothing depends on them, she says. She is convinced, though, that the protests will change a lot. There is no going back. The biggest success so far, she says, for the entire period of transition is the EU membership. I will not give up, she tells me and blows again the whistle. I admit that I would not have given her the age. She looked at least ten years younger, lightened up by the fact that she is taking part in her future. Several meters to the left I find another lonely figure of a young man - the 19 year-old student Velizar Donchev who studies in the Theology University. Unlike Valentina who attends the protests from day one, he joined on day 40 because before that he was abroad. For his entire conscious life, which he said was 7-8 years, there was no appropriate government. Hardly something will change with new elections unless the electoral code is changed, the young man says and states firmly he does not feel lonely in the protest. He does not want to emigrate, but hesitation can be felt in his responses - if things do not go in the desired direction, he will leave. 23-year old Ivaylo says he started protesting long before Peevski. According to him, this government does not reflect the public opinion. For them voted less than half of those who voted, not those who are eligible to vote. He also does not feel lonely, on the contrary. He comes to protest in order for the spark to be maintained alive because many of his friends currently are unable to come. Some of them are tired, others have things to do. Says he feels important when on the square and believes that it is not in vain. But still, there is a spark of hesitation. On the one hand he firmly states he will continue till the end (resignation), but on the other he admits that slight hesitation has appeared. According to Valentina, there is division but it is artificially created. She is convinced, on the basis of her talks with many people from various political colours, that there is unanimity on many of the problems Bulgaria has. It is a matter of time unity to be achieved. And who are you from? The protest is slightly preparing to leave Independence square while the sun is setting down to go in front of the Parliament, leaving behind deafening silence. 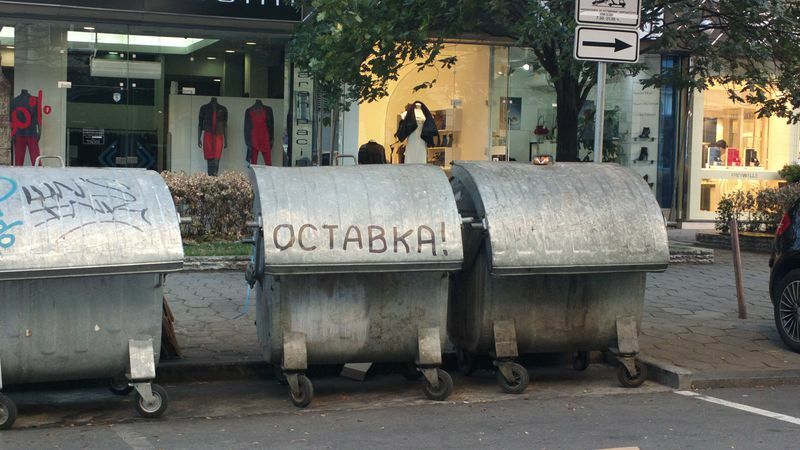 Although small, the protest occupies the entire boulevard beside the place which once hosted the mausoleum of one of the founders of the communist dictatorship - Georgi Dimitrov. A memorial that was demolished with explosions in the beginning of transition as a symbol of the farewell with the past. Alas, a parting that appears too symbollic more than 15 years later. Now there is a parking lot on the spot and the city park is expanded - a wonderful place where in the day, under the autumn sun, you can listen to an old man from the Roma origin to play wonderful jazz on a saxophone sitting on one of the park benches, and further on young people are gathering to draw the beautiful buildings around the People's Theatre. Traditionally, this is the park of observers - a place where vagabonds gather together to play chess and many more idlers just observe them a whole day, betting on them. Once, the mausoleum in the end of the park was standing face to face with the palace of the pre-communist Bulgarian kingdom. Now the palace is a gallery which now has a broad view onto the beautiful park and seems to have forgotten how from the terrace of the mausoleum the totalitarian majesties were waving their hands to the freezing pupils organised for a manifestation in the always rainy May - either to mark the Labour Day on May 1st or the Day of Bulgarian Alphabet and Culture (May 24). I have personal memories from the time. All of them unpleasant. And most of all the feeling of cold and no right at all of a choice not to go. On the evening of September 24th, along the boulevard which once set against each other the palace and the mausoleum the protest is dawdling along slowly with placards and shouts "resignation", "mafia" and other slogans, some of which long as half an article. But along the way a conflict breaks up. 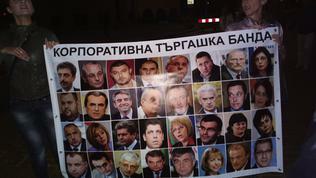 A small group of protesters is caring a placard with the faces of key figures from the transition. Some of them idols of other protesters. A brawl erupts. There is a smell of alcohol in the air. Famous faces of the protests, like the journalist Ivo Bozhkov who was webcasting tirelessly the protests for days, tried to cooled the conflict down and prevent a fight. The night before there was a fight. 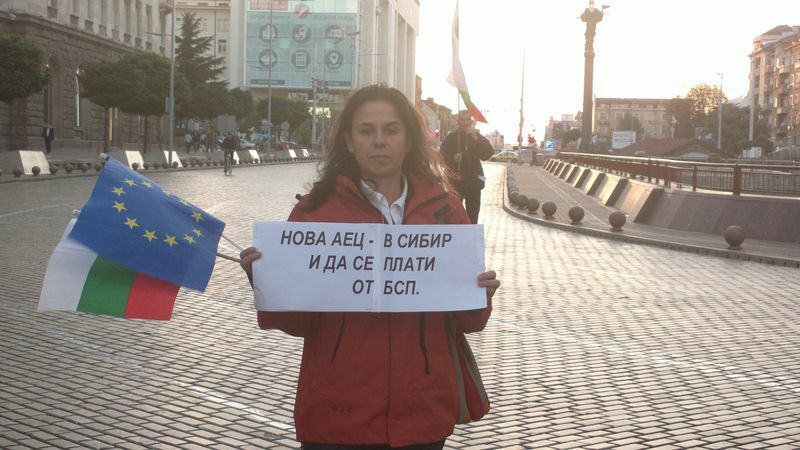 One of the protesters with the controversial placard is 30-year old Theodora Ivanova. She is angry and speaks with desire. Says she does not want only "resignation" to be shouted, but to be told why this resignation is demanded. And the reason is that "the same snouts have been governing us for 70 years". According to her, the resignation will not solve the problem. Many changes are needed. She does not know whether the next government will accept them, but if it does not and there is no dialogue with it, then she will protest it too. She and her friends are readily posing for photographers. 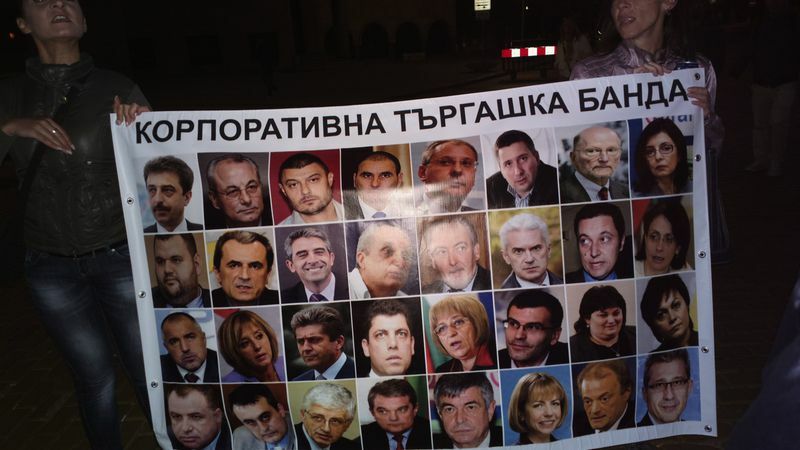 On the placard can be seen the faces of former Prime Minister Ivan Kostov (1997-2001), of Bulgaria's first European Commissioner and now a leader of one of the new political formations in the country Meglena Kuneva. There is the image of the king, the former Prime Minster Simeon Saxe-Coburg-Gotha (2001-2005). There are many from the current governance - the BSP and PES leader Sergey Stanishev, who governed the country from 2005 until 2009, the MRF leader Lyutvi Mestan and his predecessor Ahmed Dogan. Theodora says she has been protesting for ... 7 months against the mafia because the formula of government now is politicians+oligarchs=mafia. She believes that in the beginning within the protest could be heard many "againsts" - against Kostov, Boyko, Oresharski. Now the protest is no longer motley, it is not even partyless and is not civil, she is convinced, while the brawl erupts again. According to her, the division is a fact. She dreams of a united society against the mafia. This can happen by awakening the people and inviting them to come to protest. Nothing can make her give up, she says. I ask her if she ever thought of emigrating. She had, admits, but she cannot leave her country - she loves it. She hates the state, but loves the homeland. A remark I heard hundreds of times throughout my entire conscious life in Bulgaria. Already in front of Parliament the protest has additionally shrank along the way. Only the most active people remained. The brawl between those with the placard with all the "servants of the past" (after Theodora) and those who believe they are traitors, continues. Revolutions are not laundry or factories for CVs, tells me my guide - Iren Phileva, a journalist with the Bulgarian National Radio who hosts the programme "The Club of Journalists". A TV camera is recording the opinions of everyone involved in the brawl. The smell of alcohol is increasing. Within the crowd appears one of the most recognisable faces of the protest - Assen Genov. He has a long history of protests. He was among the leading people who protested in January 2009 against the then government of the Triple Coalition led by Sergey Stanishev. A protest that was dispersed by the authorities. Assen Genov is also among the most active in the green protests against the multiple encroachments on protected natural territories for construction. He is also a famous blogger and the initiator of the protest against Delyan Peevski by creating the event on Facebook. He is often blamed he is a "Sorosoid" (paid by Soros) or a "professional protester". He knows precisely how many days have passed since the beginning - 103 (by September 24th). The first thing that had been achieved for those more then three months is that now it is freely being spoken on media about the oligarchy and mafia, he explains. "From now on, no authority should feel certain that its actions will remain unnoticed or unpunished if they are beyond a formally acceptable boundary of tolerance". Assen Genov is not worried by the small number of protesters because, according to him, if all the tens of thousands of people who protested in Sofia in these 103 days are counted their total number will be hundreds of thousands. Those are real people, he says, who expressed their disagreement. And that is reflected in opinion polls. The latest, published on October 2, says that 76% want early elections. Moreover, Assen Genov is convinced that the winter will not kill the protest, on the contrary. 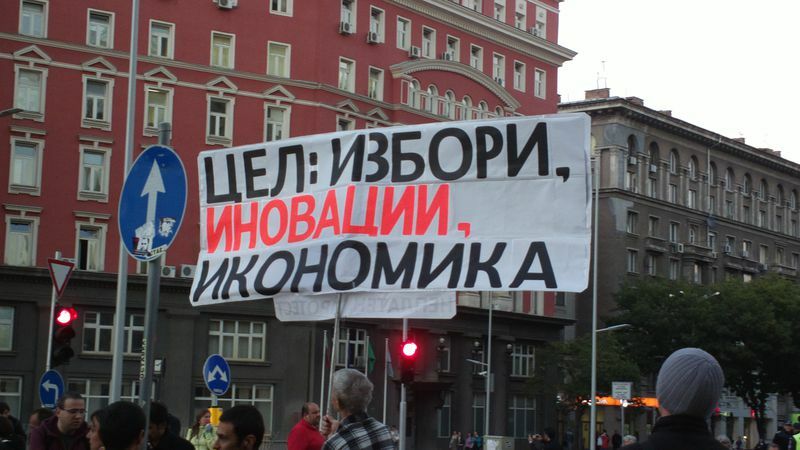 In January and February, people will receive their really big electricity bills and then there will be huge protests. This government is doomed, he is convinced. What comes next, however? "We missed the historical moment when, actually, a path could be opened for a genuine social democracy in Bulgaria. The BSP did everything possible to proclaim themselves as legatees, successors of the Bulgarian Communist Party. Why did the BSP want to be successors of the BCP and did not go through a catharsis in the beginning of the 1990s? I believe that if any new political subjects or pure politicians make it in Parliament, who will really keep their integrity, will not sell themselves, remain tribunes of what people want, ten people are enough to speak, to oppose and vote against, people will believe them". This is how the blogger imagines the future. 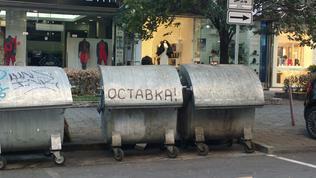 The end of the week I was in Bulgaria and during which the summer returned at full speed was marked by a Facebook bomb. Part of the protesters dropped on Facebook a fake rumour that the government was to fall. This literally blew up the social network and made journalists attentive. But then it quickly became clear that it was about another action of the core of the protest. A new portion of division followed. Even the supporters in principle of the protest who, however, are not always on the square or never, were proclaimed enemies for not accepting that the government should be attacked with the same methods it itself uses - disinformation. How long will the division last and is it irreversible is a question that awaits an answer. For sure Bulgaria will never be the same after this first summer of awakening when the beginning of the end was put. Now what remains to be done is to find will for that unity the 50-year old Valentina dreams of, the protester from the beginning of this story. A unity for the future. A future without a mask, with clean hands and clean thoughts. A future that looks very far but also very possible, too. A hand away - a hand stretched to those who think differently.